af·flu·ent [áffloo ?nt, a fl? 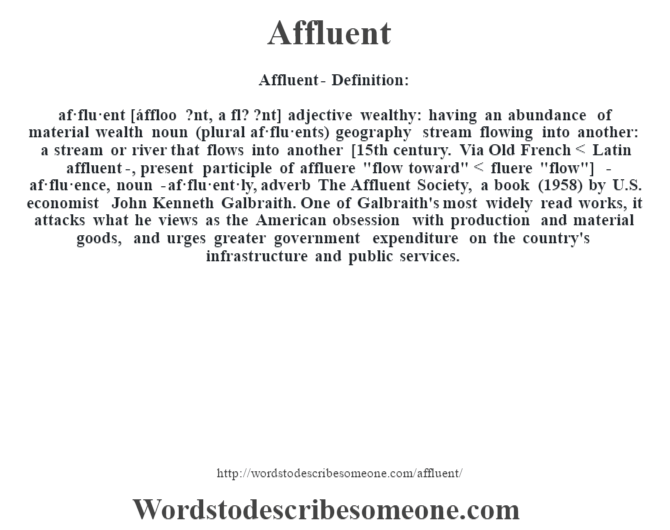 ?nt] adjective wealthy: having an abundance of material wealth noun (plural af·flu·ents) geography stream flowing into another: a stream or river that flows into another [15th century. Via Old French < Latin affluent-, present participle of affluere "flow toward" < fluere "flow"] -af·flu·ence, noun -af·flu·ent·ly, adverb The Affluent Society, a book (1958) by U.S. economist John Kenneth Galbraith. One of Galbraith's most widely read works, it attacks what he views as the American obsession with production and material goods, and urges greater government expenditure on the country's infrastructure and public services.